May not order this again from your company. The letter was perfect for my grandson but I was disappointed because I ordered three letters for my three grandchildren -- all at the same address. This letter came first and the other two more than a week later that made the older two grandchildren disappointed that they didn't receive a letter. Also -- a tentative delivery date would have been helpful. It only states before Christmas. My nephew loved receiving his letters from Santa! I buy these Santa cards every yr for my great grandchildren and will keep buying them as long as I am able to do so. 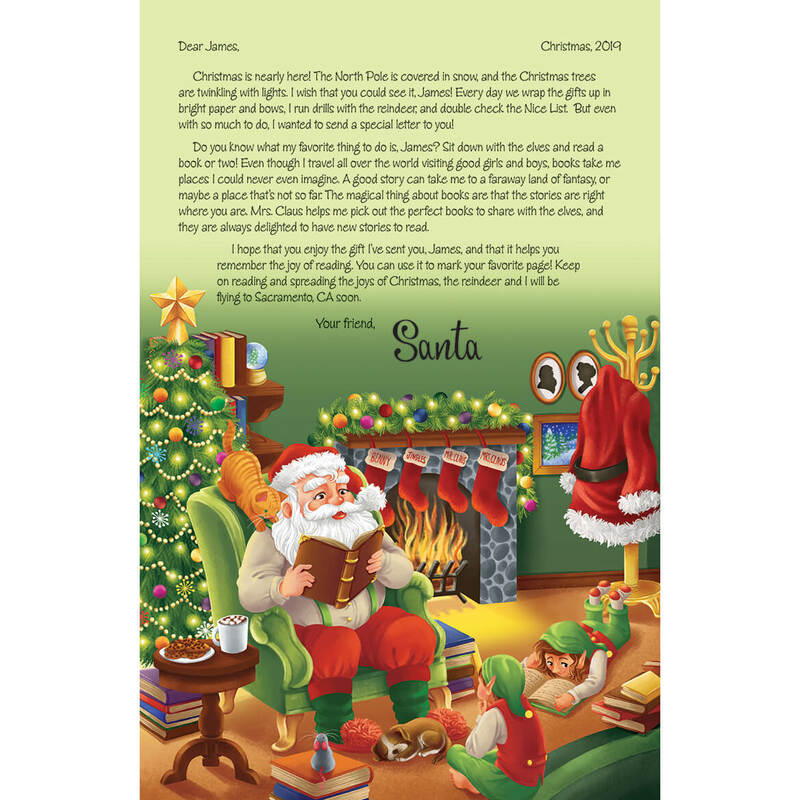 For my grandchildren they will be so excited about getting a letter from Santa. Thank you . 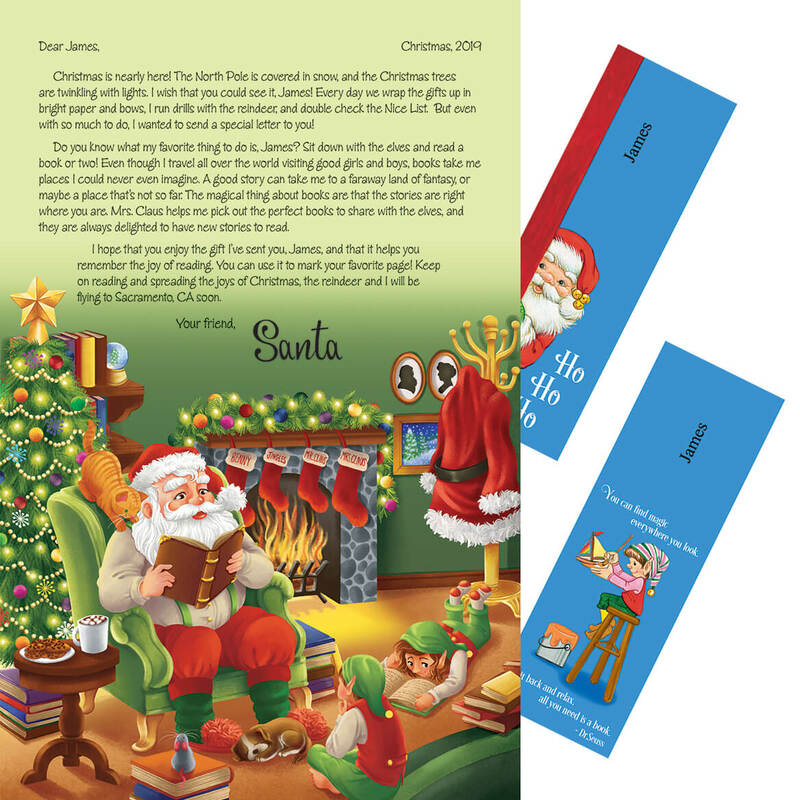 This Santa letter and bookmarks are awesome. My Grandson will love them! I send this to my youngest grandson every year!! My grandchildren love getting mail and then from Santa Clause, they get excited. I have been ordering these letters for years now, even to my 17yr.old grandchild, he gets a good laugh. They are worth every penny, quality paper. I think my nephew will like this. It was age appropriate for my grandson. He will love the pictures on the letter and the book markers with his name. Have been looking at several sites and liked this one the Best. I wanted something personal for my grandkids at Christmas and this received many excellent reviews. cause my son still believes and as long as he believes I will try and Make it as memorable as I can. Need more choices off Letters from Santa. My granddaughters will enjoy the letters from Santa. I like the Ideal that you have different letters. You have a choice of three different letters from Santa. One letter with 2 personalized Bookmarkers.. The other Santa letters come with a tree ornament. My child loves to read. My grand kids enjoy receiving these. I sent one last year so I'm sending another. She loved it. Liked that it was offering something different then the usual ornament to go along with the letter, especially since it was personalized bookmarks. Will get good use all year round instead of just Christmas. To make Christmas special to the children I send letters to. I’ve ordered these letters for eight years now for my nephews. They love them! Youngest grandchild, age 3. I'd have preferred another option with an ornament, like her brothers are getting, but this will do. Can one card be sent with 2 names on it and each bookmark has one of their names on it.? That way each child has their own bookmark with their name on it. BEST ANSWER: Thank you for your question. Unfortunately only one name can be printed on each letter. We hope this information will be of help to you. TWO NAMES CAN BE PUT ON, WHAT I DID WAS ABB NAMES, BECAUSE THEY ONLY GIVE YOU SO MANY SPACES, BUT THEY WILL ONLY GIVE YOU ONE BOOKMARK. How is the outside of the letter addressed? BEST ANSWER: IT WILL BE ADDRESSED TO THE CHILD. THEY JUST WANT TO KNOW THE PARENTS (GUARDIANS NAME) SO IT GOES TO THE CORRECT ADDRESS. The outside of envelope is addressed to child that is put down to receive this letter from Santa. I hoped this helped. The outside envelope is addressed to the child who will receive the letter with book marks. The letter is addressed to the child. Is it sent from north pole on the outside of the envelope? BEST ANSWER: Thank you for your question. The outside of the envelope will say from the North Pole. We hope this information will be of help to you.